War Thunder Game Hub: Combat AI concerns for DCS WWII? One of the critical elements for any WWII prop fighter sim is the combat AI for offline play. Single players want computer AI that reacts almost like a human...yes, it makes mistakes, but it isn't dumb and doesn't defy the laws of physics. It isn't suicidal, but it is aggressive, and if you get on its tail, it will try to shake you off first, and then turn the tables on you and get on your six. The vanilla IL2 couldn't do it, and it wasn't until Team Daidolos came along and worked on the AI routines that it started to put up a fight. Cliffs of Dover couldn't do it either - the only way you were going to get shot down in CoD was by friendly fire! BOB2 did it. The BOB2 AI routines gave the AI situational awareness coupled with skill based access to hundreds of possible manouvres. You could config not only the skill levels but the level of aggression of your opponents. The only time I broke into a heart pounding 'holy fark I nearly died' sweat was in a long drawn out dogfight in BOB2. But BOB2 is showing its age now. How about the upcoming DCS WWII platform? Will it deliver the goods? Well it is way to0 early to tell, because the devs are still in the early stages of making 3d models and cockpits, let alone getting them flying or fighting. You can already take to the skies in one of the DCS WWII machines, the P-51D, against an AI FW190 Dora. The AI Dora was released early last year, and Youtube abounds with dogfight videos of the DCS warbirds duking it out. And not that I want to worry you, but those fights are very, very...one sided. Have a look at this one, for example. You will see it is pretty typical if you google others. Once he gets the Dora in his sights, and gets on its six, it does very little to try to shake him, and certainly doesn't even look close to turning the tables on him. This is also my experience in the DCS World P-51D vs Dora. The only time you are likely to die is in the merge. Same applies if you engage in a P-51 vs P-51 fight. Sometimes you'll get a kill quickly, sometimes it takes longer, but it is very very rare the AI will clobber you. You write like someone who hasn't seen the dozens of posts about the DCS AI being too difficult. Yes, if you are an experienced virtual pilot it's not too much trouble, but the DCS AI is more competent than the AI in most other titles. I can only write from my experience, but I also refer to the many many videos on Youtube showing the same thing. Once you get on the six of the enemy AI, you have to try really hard to screw up before the AI will get back on your six or get a firing solution. I am rarely if ever shot down by AI in DCS in the prop vs prop dogfights. Think the biggest problem will be the game engine. 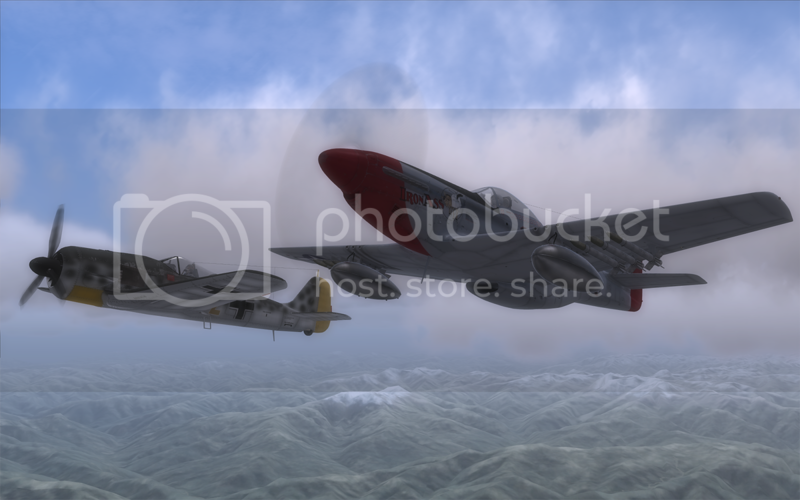 Try setting up a dogfight between a couple of P-51s and four or five Fw-190 D9s. The game DCS engine just can't handle it. Luthier's stong point has always been producing beautiful cockpits. The Cliffs of Dover mess showed he (or the people he employs) lack skills when it comes to the hard slog of coding. Slightly OT, but they could learn a lot from OBD Software. The AI in their new Wings Over Flanders Fields is a game changer (no pun intended). The best AI prior to this point was BOB II, and DCS is actually pretty good. Developers seem to be in love with online gameplay, but there are plenty of single players who need strong AI. WOFF AI is good, but it's not a game changer. The WOFF AI will chase to an enemy airfield many km behind the lines, and *then* tries to run for home when it is far too late. It also has problems knowing when and when not to engage. I have seen it do a lazy descent to land while its wingmen are being attacked by enemy aircraft.